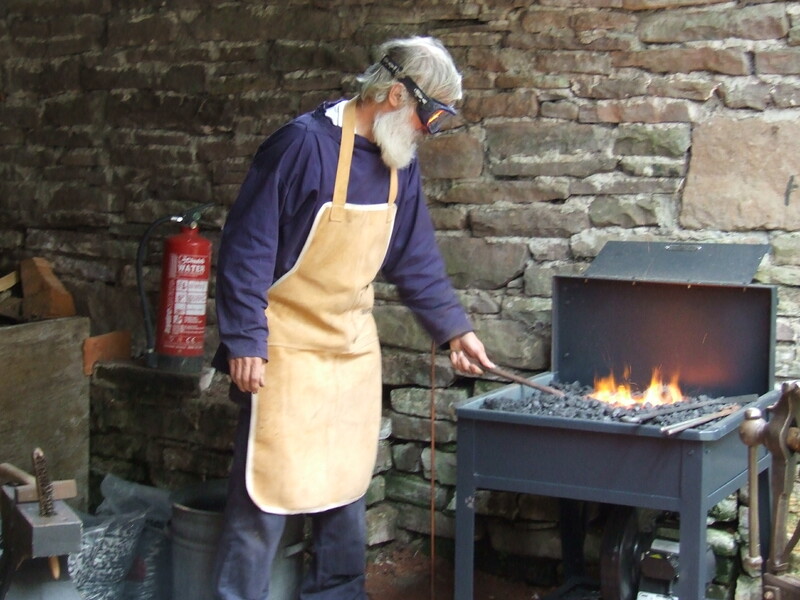 ianmabberley	Garden accessories	Blacksmithing, Forge, Greystone, Grwyne Fawr railway, Hereford(Holme Lacy) College, Mike Judd	Comments Off on Forging or Forgery? I suppose that it is one of those delightful quirks of the English language where two very diverse meanings accrue to one word. 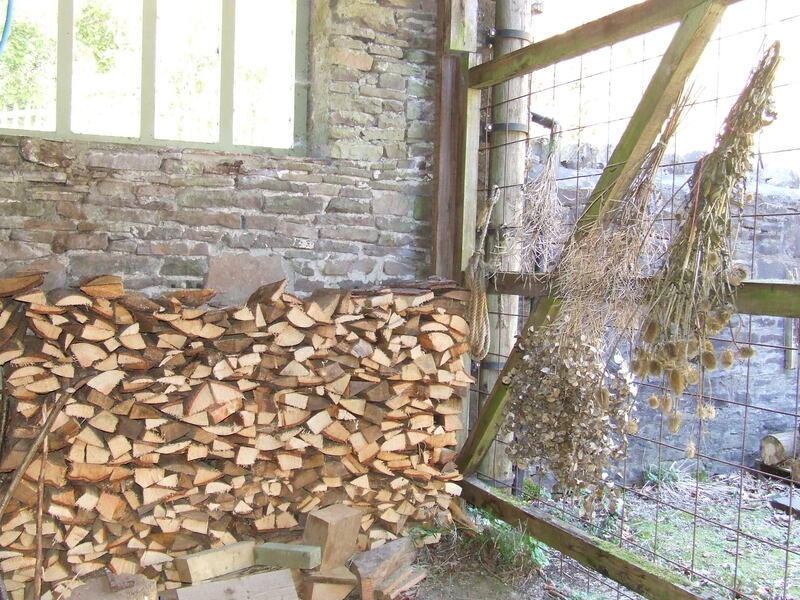 ‘To Forge’: 1) to make new items by the heating and working of metal. 2) to make a fake items with the intention to confuse or defraud. 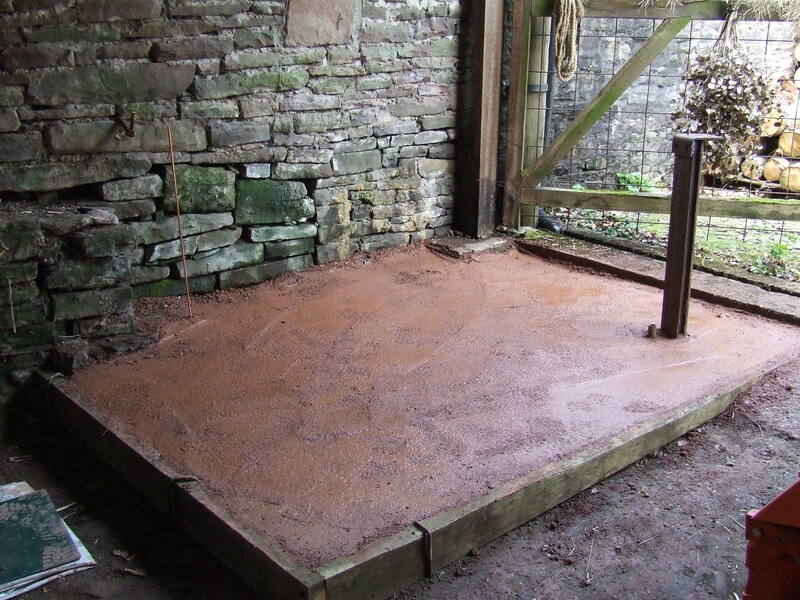 Well, the Nant y Bedd forge is now up and glowing and there’s nothing fake about what I hope will be coming out of it. Sue (with a contribution from my Mother) bought me the forge for my recent 60th Birthday. Here it is on the website of Greystone Forge, who hand-built it. Anyone thinking of getting a forge could do a lot worse than to contact Mike Judd at Greystone for a chat and a quote. He tells me he has relatives living near here, so one day he may pop in to see if I’m making a reasonable job of things! Scary! For the uninitiated the bit at the back is the ‘bosh’ which is filled with water to cool down the sticky-out bit – the tue iron – which transfers the air from the blower underneath (no room here for a small boy pumping on a large bellows) into the fire. 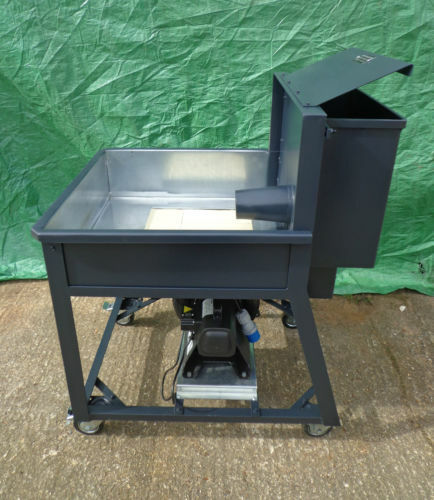 But it’s not just the forge itself that is needed so E-Bay was raided for an anvil (cost supported by Natalie, Geraldine and Martin), a leg vice (that’s a vice with a supporting leg, not what you might otherwise be thinking! )and a quantity of forging tools. The big decision was where to put it. Initially I was thinking about wheeling it out into the open whenever I wanted to forge, but the spell of wet we’ve just had made me think again – I wouldn’t have been able to do anything with it for the first couple of months of this year – so a corner of one of the sheds has been pressed into action, seen here in it’s previous incarnation as part of the wood store. Sue’s drying plants will have to go! But, of course the floor wasn’t level, so the best part of a ton of rolling stone was firmly whacked into place. 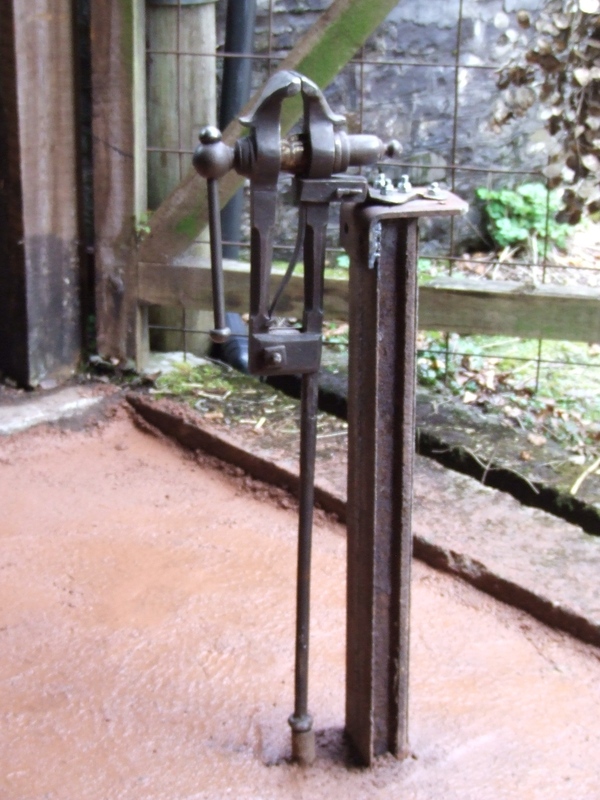 Before the stone was laid, I made a stand for the leg-vice out of some old railway track I found round the back of the tractor shed. Recycling part of the history of the valley – the railway line was laid to bring the materials up the valley to the reservoir dam site as it was being constructed, before the road was here. Three pieces welded together and sunk 2’6″ into concrete, it should be solid! It’s a lovely old vice and in great working order. The anvil came from just outside Newport, so the old Land Rover was pressed into action for a longer than usual journey. When I arrived to collect it, the kind owner had giving it a coat of light grey paint – not really what I wanted – and so I’ve covered that in black for the time being. I might wire brush it all off one day. 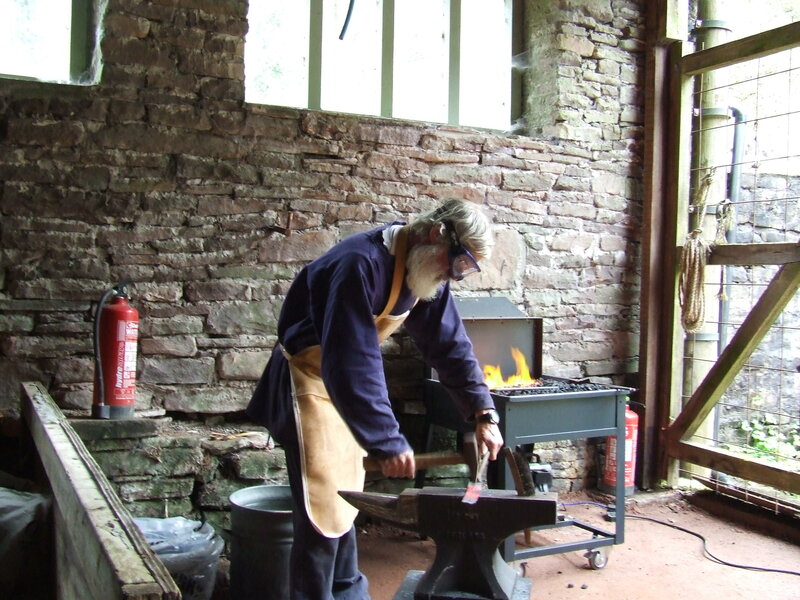 E-Bay also supplied a wonderful load of hammers, chisels and tongs from a blacksmith was is retiring – thanks Geoffrey. Having seen the price of new ‘weapons’ I think I got a bargain, there’s so many I can hardly lift them all once. The final piece of the jigsaw was getting the same coke (there’s another word with somewhat diverse meanings) as I was using when I did my evening class at Hereford (Holme Lacy) College. There’s only a few places selling Blacksmith Breeze, as it’s known, and one of them is just outside Leominster, so a quick trip to Bengry’s got me sufficient to get started. I might experiment with local charcoal one day, after all the name of the area here is Fforest Coal Pit, forest coal being the old name for charcoal, and there are the remains of many of the original hearths in the valley, which supplied local ironworks in Glangrwyney and further afield before coal and coke become more readily available and easier to transport. Shirley Rippin’s book The Charcoal Industry of Fforest Coalpit & the Grwyne Fawr Valley explains it in fascinating detail. Eventually, Sue ran out of other jobs for me to do, so as April draws to a close I finally get to fire it up. I need some side pieces for the benches that I’m repairing / recycling and, in the spirit of trying to recycle where possible, I found a couple of old gate latches which needed lengthening but were otherwise just right – they even had a handle for holding on to while forging. However I get the feeling that they are made of tool steel or similar as it seems to be taking a long time to add the 3″ I need. I’m restarting the Holme Lacy course again on Monday, so I’ll be after some expert opinion on that. Note the Elf and Safety fire extinguisher! I mentioned the anvil earlier, so here it is in use. It is marked as 1.5 cwt so is pretty difficult to move, but I think I maybe need to raise it an inch or two. The quench bucket just behind me is another Pontrilas auction find, as are the extinguishers and I promise to get the wiring sorted out permanently as soon as possible! 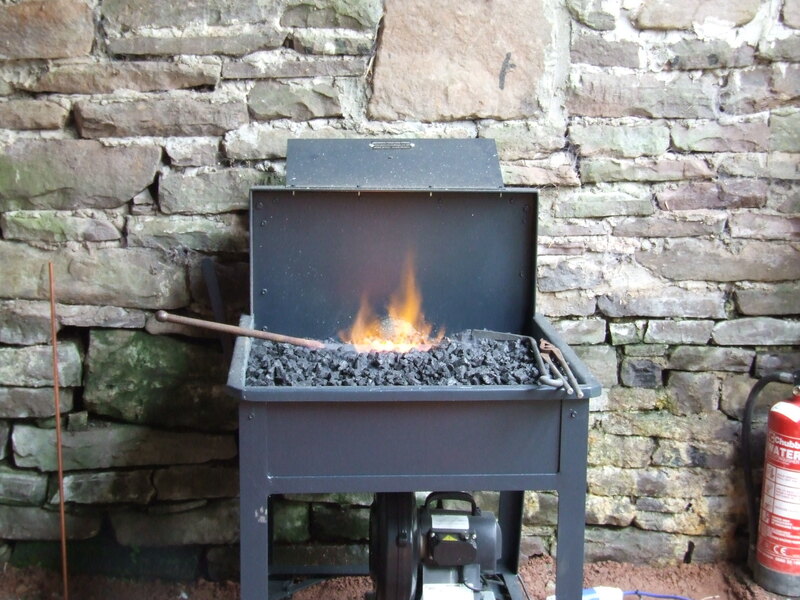 I also plan to get a small hood and flue which may make lighting the forge a bit easier and a lot less smoky.